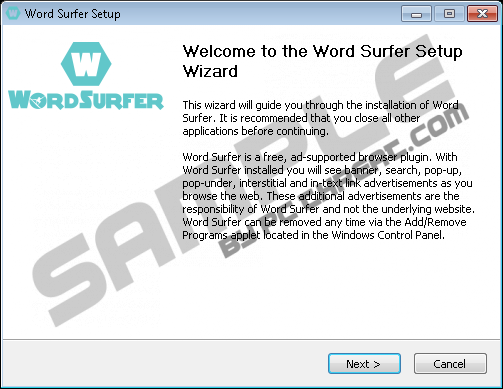 WordSurfer is an application that is primarily operated using the service called “wsasvc.exe*.32”. If you do not terminate this process and delete the app itself, it is very likely that you will start seeing ads every time you browse the web. If you are lucky enough, you will find ads with the tag "powered by WordSurfer," which should help you recognize the program that requires removal. Of course, not all users realize that they need to delete unreliable programs showing seemingly harmless ads. Please read this report to learn why interacting with online ads can be dangerous. We have no doubt that after learning the truth you will rush to remove WordSurfer. Even though users are offered to learn about WordSurfer at wordsurferapp.com, this ad-supported program is spread using software bundles. Just like Wordanchor, QuickSurf, and other clones, it could be installed with undesirable and highly malicious programs. What kind of software follows WordSurfer depends on the third-party software distributors, and they are unpredictable. Needless to say, if malicious infections slither in, you will need to delete them as well. If you have any questions about third-party threats and their removal, you can either use our article database or use the comments box below to start a discussion. Since third parties spread WordSurfer, it is not at all surprising that most users do not know much about this program. Of course, if you were at least a bit cautious, you would know that WordSurfer is an ad-supported program, as this is not kept in secret. The official website informs users that this program can provide free web surfing and translation services only because it showcases the ads of affiliate parties. Unfortunately, users are not provided with a lot of information about these parties, which is why trusting them is considered to be very dangerous. If you are not comfortable with suspicious programs running on your PC, you have to delete WordSurfer ASAP. No matter what sites you visit, you will encounter ads up until you remove WordSurfer from your PC. This ad-supported program uses a running process to contact adware servers that host ads associated with different parties. According to our previous research, there are many unreliable adware servers that host malicious ads. Even though we cannot claim that you will be exposed to malicious ads if you trust WordSurfer, this is something you need to consider before you conclude that this ad-supported program is reliable. Even if you do not see ads now, there are no guarantees that they will not show up in the future. Users who have their operating systems protected by reliable security software do not have to worry about the removal of WordSurfer or other suspicious programs. If this ad-supported program is the only threat that you need to delete, you are in luck, as there are far worse infections out there. If you have time to install security software, we recommend that you do; otherwise, your virtual security will remain weak even if you delete WordSurfer successfully. Open the Charm bar, click Search, and type Uninstall a program. Launch the menu and right-click the program you want to delete. Select Uninstall to delete WordSurfer. Open the Control Panel menu and move to Uninstall a program. Right-click the program you wish to delete from your PC and select Uninstall. Open the Start menu by clicking the Start button on the Taskbar. Identify the undesirable application, select it, and click Remove. Quick & tested solution for WordSurfer removal.